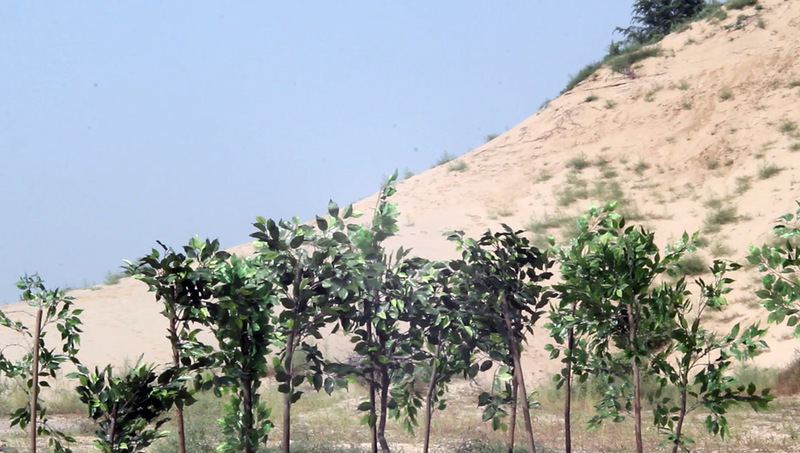 Shelter Belt is a video installation of a performance that took place on a concrete platform on one of the last remaining sand dunes in Shacheng (Sand City), Hebei province, a district which supposedly formerly suffered from sandstorms before the implementation of a large scale afforestation initiative. The performance consisted of a choreographed set of motions by robotically articulated artificial poplar trees, a species used in the region for soil stabilization. The video is viewed in a cinema through fences that are typically used to restrict access to afforested plots of land. This work was first commissioned in the summer of 2016 and originally exhibited as part of Tides of Sand and Steel at Si Shang Art Museum. Shelter Belt was actualized in collaboration with ADL.